bebop spoken here: CD Review: Drifter - Flow. 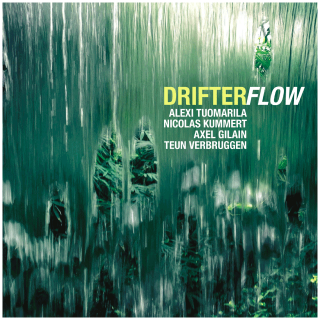 CD Review: Drifter - Flow. Alexi Tuomarila (pno); Nicolas Kummert (sax/vcl); Axel Gilain (bass/vcl); Teun Verrbruggen (dms). A quartet based in Belgium led by a Finnish pianist and an album that is aptly named - Flow! That indeed is what the music does flowing gently although not without an occasional burst of turbulence that threatens to turn the flow into a torrent. It never quite does which is part of the charm; taking you to the brink but staying within the bounds of sanity. Kummert has a rich, dry, Getzian sound - so pure I'm not quite certain whether he's playing tenor or alto! Either way it is just perfect for the 'flowing' moods. He also contributes some vocal chants along the way which blend well with the overall soundscape. Tuomarila is equally inventive both as pianist, composer and arranger. Comparisions have been made with Keith Jarrett's European Quartet and they are valid in fact, upon reflection, I think these guys have edged it. Tuomarila and Kummert may be co-leaders but Gilain and Verbruggen are no mere hitchhikers but bring their own voice to the party - in the case of Gilain, literally as, like Kummert, he too operates in the words dept. not just chanting but also writing a lyric for the pianists composition Nothing Ever Lasts. Axel composed one piece, Alexi four, Nicolas 3 and Sting's King of Pain was arranged by Alexi. Interesting how more and more of Sting's compositions are becoming part of the jazz canon. Not a CD to annoy the neighbours with but maybe one to open up their minds! Available now on Edition Records EDN1059. Roy Ayers @ Hoochie Coochie - July 17. CD Review: Rebecca Kilgore Trio - Just Imagine. Jazz Café jam session coda – Francesco sings! Jam Session @ The Jazz Café - July 7. Belated news on the passing of Joe McMullen. CD Review: The Weave - Knowledge Porridge.